Born in Kovno, Russian Empire (now Kaunas, Lithuania) to a Jewish family, Goldman emigrated to the United States in 1885. Attracted to anarchism after the Haymarket affair, Goldman became a writer and a renowned lecturer on anarchist philosophy, women's rights, and social issues, attracting crowds of thousands. She and anarchist writer Alexander Berkman, her lover and lifelong friend, planned to assassinate industrialist and financier Henry Clay Frick as an act of propaganda of the deed. Frick survived the attempt on his life in 1892, and Berkman was sentenced to 22 years in prison. Goldman was imprisoned several times in the years that followed, for "inciting to riot" and illegally distributing information about birth control. In 1906, Goldman founded the anarchist journal Mother Earth. In 1917, Goldman and Berkman were sentenced to two years in jail for conspiring to "induce persons not to register" for the newly instated draft. After their release from prison, they were arrested—along with 248 others—and deported to Russia. Initially supportive of that country's October Revolution that brought the Bolsheviks to power, Goldman changed her opinion in the wake of the Kronstadt rebellion; she denounced the Soviet Union for its violent repression of independent voices. She left the Soviet Union and in 1923 published a book about her experiences, My Disillusionment in Russia. While living in England, Canada, and France, she wrote an autobiography called Living My Life. It was published in two volumes, in 1931 and 1935. After the outbreak of the Spanish Civil War, Goldman traveled to Spain to support the anarchist revolution there. She died in Toronto, Canada, on May 14, 1940, aged 70. During her life, Goldman was lionized as a freethinking "rebel woman" by admirers, and denounced by detractors as an advocate of politically motivated murder and violent revolution. Her writing and lectures spanned a wide variety of issues, including prisons, atheism, freedom of speech, militarism, capitalism, marriage, free love, and homosexuality. Although she distanced herself from first-wave feminism and its efforts toward women's suffrage, she developed new ways of incorporating gender politics into anarchism. After decades of obscurity, Goldman gained iconic status in the 1970s by a revival of interest in her life, when feminist and anarchist scholars rekindled popular interest. 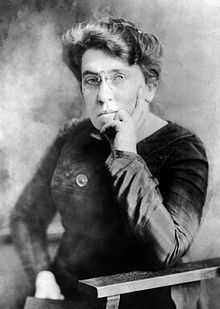 Emma Goldman was born into an Orthodox Jewish family in Kovno in the Russian Empire, which is now known as Kaunas in Lithuania. Goldman's mother Taube Bienowitch had been married before to a man with whom she had two daughters—Helena in 1860 and Lena in 1862. When her first husband died of tuberculosis, Taube was devastated. Goldman later wrote: "Whatever love she had had died with the young man to whom she had been married at the age of fifteen." Taube's second marriage was arranged by her family and, as Goldman puts it, "mismated from the first". Her second husband, Abraham Goldman, invested Taube's inheritance in a business that quickly failed. The ensuing hardship, combined with the emotional distance of husband and wife, made the household a tense place for the children. When Taube became pregnant, Abraham hoped desperately for a son; a daughter, he believed, would be one more sign of failure. They eventually had three sons, but their first child was Emma. The family moved to the Russian capital of Saint Petersburg, where her father opened one unsuccessful store after another. Their poverty forced the children to work, and Goldman took an assortment of jobs, including one in a corset shop. As a teenager Goldman begged her father to allow her to return to school, but instead he threw her French book into the fire and shouted: "Girls do not have to learn much! All a Jewish daughter needs to know is how to prepare gefilte fish, cut noodles fine, and give the man plenty of children." Goldman pursued an independent education on her own, however, and soon began to study the political turmoil around her, particularly the Nihilists responsible for assassinating Alexander II of Russia. The ensuing turmoil intrigued Goldman, although she did not fully understand it at the time. When she read Nikolai Chernyshevsky's novel, What Is to Be Done? (1863), she found a role model in the protagonist Vera. She adopts a Nihilist philosophy and escapes her repressive family to live freely and organize a sewing cooperative. The book enthralled Goldman and remained a source of inspiration throughout her life. In 1885, her sister Helena made plans to move to New York in the United States to join her sister Lena and her husband. Goldman wanted to join her sister, but their father refused to allow it. Despite Helena's offer to pay for the trip, Abraham turned a deaf ear to their pleas. Desperate, Goldman threatened to throw herself into the Neva River if she could not go. Their father finally agreed. On December 29, 1885, Helena and Emma arrived at New York City's Castle Garden, the entry for immigrants. At her new job, Goldman met a fellow worker named Jacob Kershner, who shared her love for books, dancing, and traveling, as well as her frustration with the monotony of factory work. After four months, they married in February 1887. Once he moved in with Goldman's family, however, their relationship faltered. On their wedding night she discovered that he was impotent; they became emotionally and physically distant. Before long he became jealous and suspicious. She, meanwhile, was becoming more engaged with the political turmoil around her—particularly the aftermath of executions related to the 1886 Haymarket affair in Chicago and the anti-authoritarian political philosophy of anarchism. Meanwhile, Goldman had begun a friendship with Berkman, whom she affectionately called Sasha. Before long they became lovers and moved into a communal apartment with his cousin Modest "Fedya" Stein and Goldman's friend, Helen Minkin, on 42nd Street. Although their relationship had numerous difficulties, Goldman and Berkman would share a close bond for decades, united by their anarchist principles and commitment to personal equality. In 1892, Goldman joined with Berkman and Stein in opening an ice cream shop in Worcester, Massachusetts. After a few months of operating the shop, however, Goldman and Berkman were diverted by becoming involved in the Homestead Strike in western Pennsylvania near Pittsburgh. Berkman and Goldman came together through the Homestead Strike. In June 1892, a steel plant in Homestead, Pennsylvania owned by Andrew Carnegie became the focus of national attention when talks between the Carnegie Steel Company and the Amalgamated Association of Iron and Steel Workers (AA) broke down. 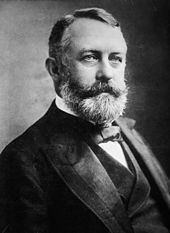 The factory's manager was Henry Clay Frick, a fierce opponent of the union. When a final round of talks failed at the end of June, management closed the plant and locked out the workers, who immediately went on strike. Strikebreakers were brought in and the company hired Pinkerton guards to protect them. On July 6, a fight broke out between 300 Pinkerton guards and a crowd of armed union workers. During the twelve-hour gunfight, seven guards and nine strikers were killed. Goldman, meanwhile, decided to help fund the scheme through prostitution. Remembering the character of Sonya in Fyodor Dostoevsky's novel Crime and Punishment (1866), she mused: "She had become a prostitute in order to support her little brothers and sisters...Sensitive Sonya could sell her body; why not I?" Once on the street, Goldman caught the eye of a man who took her into a saloon, bought her a beer, gave her ten dollars, informed her she did not have "the knack," and told her to quit the business. She was "too astounded for speech". She wrote to Helena, claiming illness, and asked her for fifteen dollars. When the Panic of 1893 struck in the following year, the United States suffered one of its worst economic crises. By year's end, the unemployment rate was higher than 20%, and "hunger demonstrations" sometimes gave way to riots. Goldman began speaking to crowds of frustrated men and women in New York City. On August 21, she spoke to a crowd of nearly 3,000 people in Union Square, where she encouraged unemployed workers to take immediate action. Her exact words are unclear: undercover agents insist she ordered the crowd to "take everything ... by force". But Goldman later recounted this message: "Well then, demonstrate before the palaces of the rich; demand work. If they do not give you work, demand bread. If they deny you both, take bread." Later in court, Detective-Sergeant Charles Jacobs offered yet another version of her speech. A week later Goldman was arrested in Philadelphia and returned to New York City for trial, charged with "inciting to riot". 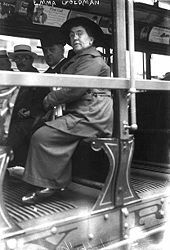 During the train ride, Jacobs offered to drop the charges against her if she would inform on other radicals in the area. She responded by throwing a glass of ice water in his face. As she awaited trial, Goldman was visited by Nellie Bly, a reporter for the New York World. She spent two hours talking to Goldman, and wrote a positive article about the woman she described as a "modern Joan of Arc." Despite this positive publicity, the jury was persuaded by Jacobs' testimony and frightened by Goldman's politics. The assistant District Attorney questioned Goldman about her anarchism, as well as her atheism; the judge spoke of her as "a dangerous woman". She was sentenced to one year in the Blackwell's Island Penitentiary. Once inside she suffered an attack of rheumatism and was sent to the infirmary; there she befriended a visiting doctor and began studying medicine. She also read dozens of books, including works by the American activist-writers Ralph Waldo Emerson and Henry David Thoreau; novelist Nathaniel Hawthorne; poet Walt Whitman, and philosopher John Stuart Mill. When Goldman was released after ten months, a raucous crowd of nearly 3,000 people greeted her at the Thalia Theater in New York City. She soon became swamped with requests for interviews and lectures. To make money, Goldman decided to pursue the medical work she had studied in prison. However, her preferred fields of specialization—midwifery and massage—were not available to nursing students in the US. She sailed to Europe, lecturing in London, Glasgow, and Edinburgh. She met with renowned anarchists such as Errico Malatesta, Louise Michel, and Peter Kropotkin. In Vienna, she received two diplomas for midwifery and put them immediately to use back in the US. Alternating between lectures and midwifery, Goldman conducted the first cross-country tour by an anarchist speaker. In November 1899 she returned to Europe to speak, where she met the Czech anarchist Hippolyte Havel in London. They went together to France and helped organize the 1900 International Anarchist Congress on the outskirts of Paris. Afterward Havel immigrated to the United States, traveling with her to Chicago. They shared a residence there with friends of Goldman. On September 6, 1901, Leon Czolgosz, an unemployed factory worker and registered Republican with a history of mental illness, shot US President William McKinley twice during a public speaking event in Buffalo, New York. McKinley was hit in the breastbone and stomach, and died eight days later. Czolgosz was arrested, and interrogated around the clock. During interrogation he claimed to be an anarchist and said he had been inspired to act after attending a speech by Goldman. The authorities used this as a pretext to charge Goldman with planning McKinley's assassination. They tracked her to a residence in Chicago she shared with Hippolyte Havel, who had come to the US; as well as with Mary and Abe Isaak, an anarchist couple and their family. Goldman was arrested, along with Isaak, Havel, and ten other anarchists. 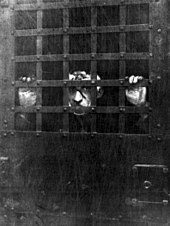 Although Czolgosz repeatedly denied Goldman's involvement, the police held her in close custody, subjecting her to what she called the "third degree". She explained her housemates' distrust of Czolgosz, and the police finally recognized that she had not had any significant contact with the attacker. No evidence was found linking Goldman to the attack, and she was released after two weeks of detention. Before McKinley died, Goldman offered to provide nursing care, referring to him as "merely a human being". Czolgosz, despite considerable evidence of mental illness, was convicted of murder and executed. Using the name E. G. Smith, she left public life and took on a series of private nursing jobs. 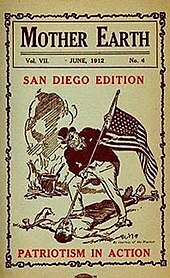 When the US Congress passed the Anarchist Exclusion Act (1903), however, a new wave of activism rose to oppose it, and Goldman was pulled back into the movement. A coalition of people and organizations across the left end of the political spectrum opposed the law on grounds that it violated freedom of speech, and she had the nation's ear once again. After an English anarchist named John Turner was arrested under the Anarchist Exclusion Act and threatened with deportation, Goldman joined forces with the Free Speech League to champion his cause. The league enlisted the aid of noted attorneys Clarence Darrow and Edgar Lee Masters, who took Turner's case to the US Supreme Court. Although Turner and the League lost, Goldman considered it a victory of propaganda. She had returned to anarchist activism, but it was taking its toll on her. "I never felt so weighed down," she wrote to Berkman. "I fear I am forever doomed to remain public property and to have my life worn out through the care for the lives of others." In 1906, Goldman decided to start a publication, "a place of expression for the young idealists in arts and letters". Mother Earth was staffed by a cadre of radical activists, including Hippolyte Havel, Max Baginski, and Leonard Abbott. In addition to publishing original works by its editors and anarchists around the world, Mother Earth reprinted selections from a variety of writers. These included the French philosopher Pierre-Joseph Proudhon, Russian anarchist Peter Kropotkin, German philosopher Friedrich Nietzsche, and British writer Mary Wollstonecraft. Goldman wrote frequently about anarchism, politics, labor issues, atheism, sexuality, and feminism, and was the first editor of the magazine. On May 18 of the same year, Alexander Berkman was released from prison. Carrying a bouquet of roses, Goldman met him on the train platform and found herself "seized by terror and pity" as she beheld his gaunt, pale form. Neither was able to speak; they returned to her home in silence. For weeks, he struggled to readjust to life on the outside. An abortive speaking tour ended in failure, and in Cleveland he purchased a revolver with the intent of killing himself. He returned to New York, however, and learned that Goldman had been arrested with a group of activists meeting to reflect on Czolgosz. Invigorated anew by this violation of freedom of assembly, he declared, "My resurrection has come!" and set about securing their release. Berkman took the helm of Mother Earth in 1907, while Goldman toured the country to raise funds to keep it operating. Editing the magazine was a revitalizing experience for Berkman. But his relationship with Goldman faltered, and he had an affair with a 15-year-old anarchist named Becky Edelsohn. Goldman was pained by his rejection of her, but considered it a consequence of his prison experience. Later that year she served as a delegate from the US to the International Anarchist Congress of Amsterdam. 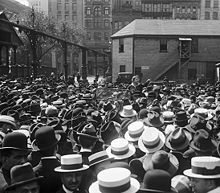 Anarchists and syndicalists from around the world gathered to sort out the tension between the two ideologies, but no decisive agreement was reached. Goldman returned to the US and continued speaking to large audiences. For the next ten years, Goldman traveled around the country nonstop, delivering lectures and agitating for anarchism. The coalitions formed in opposition to the Anarchist Exclusion Act had given her an appreciation for reaching out to those of other political positions. When the US Justice Department sent spies to observe, they reported the meetings as "packed". Writers, journalists, artists, judges, and workers from across the spectrum spoke of her "magnetic power", her "convincing presence", her "force, eloquence, and fire". In the spring of 1908, Goldman met and fell in love with Ben Reitman, the so-called "Hobo doctor." Having grown up in Chicago's Tenderloin District, Reitman spent several years as a drifter before earning a medical degree from the College of Physicians and Surgeons of Chicago. As a doctor, he treated people suffering from poverty and illness, particularly venereal diseases. He and Goldman began an affair. They shared a commitment to free love and Reitman took a variety of lovers, but Goldman did not. She tried to reconcile her feelings of jealousy with a belief in freedom of the heart, but found it difficult. Two years later, Goldman began feeling frustrated with lecture audiences. She yearned to "reach the few who really want to learn, rather than the many who come to be amused". She collected a series of speeches and items she had written for Mother Earth and published a book titled Anarchism and Other Essays. Covering a wide variety of topics, Goldman tried to represent "the mental and soul struggles of twenty-one years". In addition to a comprehensive look at anarchism and its criticisms, the book includes essays on patriotism, women's suffrage, marriage, and prisons. 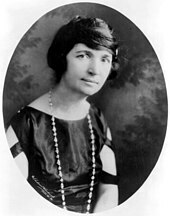 When Margaret Sanger, an advocate of access to contraception, coined the term "birth control" and disseminated information about various methods in the June 1914 issue of her magazine The Woman Rebel, she received aggressive support from Goldman. The latter had already been active in efforts to increase birth control access for several years. In 1916, Goldman was arrested for giving lessons in public on how to use contraceptives. Sanger, too, was arrested under the Comstock Law, which prohibited the dissemination of "obscene, lewd, or lascivious articles", which authorities defined as including information relating to birth control. Although US President Woodrow Wilson was re-elected in 1916 under the slogan "He kept us out of the war", at the start of his second term, he announced that Germany's continued deployment of unrestricted submarine warfare was sufficient cause for the US to enter the Great War. Shortly afterward, Congress passed the Selective Service Act of 1917, which required all males aged 21–30 to register for military conscription. Goldman saw the decision as an exercise in militarist aggression, driven by capitalism. She declared in Mother Earth her intent to resist conscription, and to oppose US involvement in the war. To this end, she and Berkman organized the No Conscription League of New York, which proclaimed: "We oppose conscription because we are internationalists, antimilitarists, and opposed to all wars waged by capitalistic governments." The group became a vanguard for anti-draft activism, and chapters began to appear in other cities. When police began raiding the group's public events to find young men who had not registered for the draft, however, Goldman and others focused their efforts on distributing pamphlets and other writings. In the midst of the nation's patriotic fervor, many elements of the political left refused to support the League's efforts. The Women's Peace Party, for example, ceased its opposition to the war once the US entered it. The Socialist Party of America took an official stance against US involvement, but supported Wilson in most of his activities. The jury found Goldman and Berkman guilty. Judge Julius Marshuetz Mayer imposed the maximum sentence: two years' imprisonment, a $10,000 fine each, and the possibility of deportation after their release from prison. As she was transported to Missouri State Penitentiary, Goldman wrote to a friend: "Two years imprisonment for having made an uncompromising stand for one's ideal. Why that is a small price." In prison, she was assigned to work as a seamstress, under the eye of a "miserable gutter-snipe of a 21-year-old boy paid to get results". She met the socialist Kate Richards O'Hare, who had also been imprisoned under the Espionage Act. Although they differed on political strategy— O'Hare believed in voting to achieve state power—the two women came together to agitate for better conditions among prisoners. Goldman also met and became friends with Gabriella Segata Antolini, an anarchist and follower of Luigi Galleani. Antolini had been arrested transporting a satchel filled with dynamite on a Chicago-bound train. She had refused to cooperate with authorities, and was sent to prison for 14 months. Working together to make life better for the other inmates, the three women became known as "The Trinity". Goldman was released on September 27, 1919. Goldman and Berkman were released from prison during the United States' Red Scare of 1919–20, when public anxiety about wartime pro-German activities had expanded into a pervasive fear of Bolshevism and the prospect of an imminent radical revolution. It was a time of social unrest due to union organizing strikes and actions by activist immigrants. Attorney General Alexander Mitchell Palmer and J. Edgar Hoover, head of the US Department of Justice's General Intelligence Division (now the FBI), were intent on using the Anarchist Exclusion Act and its 1918 expansion to deport any non-citizens they could identify as advocates of anarchy or revolution. "Emma Goldman and Alexander Berkman," Hoover wrote while they were in prison, "are, beyond doubt, two of the most dangerous anarchists in this country and return to the community will result in undue harm." At her deportation hearing on October 27, Goldman refused to answer questions about her beliefs, on the grounds that her American citizenship invalidated any attempt to deport her under the Anarchist Exclusion Act, which could be enforced only against non-citizens of the US. She presented a written statement instead: "Today so-called aliens are deported. Tomorrow native Americans will be banished. Already some patrioteers are suggesting that native American sons to whom democracy is a sacred ideal should be exiled." Louis Post at the Department of Labor, which had ultimate authority over deportation decisions, determined that the revocation of her husband Kershner's American citizenship in 1908 after his conviction had revoked hers as well. After initially promising a court fight, Goldman decided not to appeal his ruling. The Labor Department included Goldman and Berkman among 249 aliens it deported en masse, mostly people with only vague associations with radical groups, who had been swept up in government raids in November. Buford, a ship the press nicknamed the "Soviet Ark," sailed from the Army's New York Port of Embarkation on December 21. Some 58 enlisted men and four officers provided security on the journey, and pistols were distributed to the crew. Most of the press approved enthusiastically. The Cleveland Plain Dealer wrote: "It is hoped and expected that other vessels, larger, more commodious, carrying similar cargoes, will follow in her wake." The ship landed her charges in Hanko, Finland on Saturday, January 17, 1920. Upon arrival in Finland, authorities there conducted the deportees to the Russian frontier under a flag of truce. 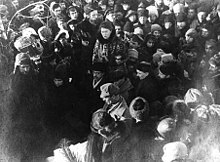 In March 1921, strikes erupted in Petrograd when workers took to the streets demanding better food rations and more union autonomy. Goldman and Berkman felt a responsibility to support the strikers, stating: "To remain silent now is impossible, even criminal." The unrest spread to the port town of Kronstadt, where the government ordered a military response to suppress striking soldiers and sailors. In the Kronstadt rebellion, approximately 1,000 rebelling sailors and soldiers were killed and two thousand more were arrested; many were later executed. In the wake of these events, Goldman and Berkman decided there was no future in the country for them. "More and more", she wrote, "we have come to the conclusion that we can do nothing here. And as we can not keep up a life of inactivity much longer we have decided to leave." In December 1921, they left the country and went to the Latvian capital city of Riga. The US commissioner in that city wired officials in Washington DC, who began requesting information from other governments about the couple's activities. After a short trip to Stockholm, they moved to Berlin for several years; during this time Goldman agreed to write a series of articles about her time in Russia for Joseph Pulitzer's newspaper, the New York World. These were later collected and published in book form as My Disillusionment in Russia (1923) and My Further Disillusionment in Russia (1924). The publishers added these titles to attract attention; Goldman protested, albeit in vain. Goldman found it difficult to acclimate to the German leftist community in Berlin. Communists despised her outspokenness about Soviet repression; liberals derided her radicalism. While Berkman remained in Berlin helping Russian exiles, Goldman moved to London in September 1924. Upon her arrival, the novelist Rebecca West arranged a reception dinner for her, attended by philosopher Bertrand Russell, novelist H. G. Wells, and more than 200 other guests. When she spoke of her dissatisfaction with the Soviet government, the audience was shocked. Some left the gathering; others berated her for prematurely criticizing the Communist experiment. Later, in a letter, Russell declined to support her efforts at systemic change in the Soviet Union and ridiculed her anarchist idealism. The 1927 executions of Italian anarchists Nicola Sacco (right) and Bartolomeo Vanzetti were troubling for Goldman, then living alone in Canada. In 1928, she began writing her autobiography, with the support of a group of American admirers, including journalist H. L. Mencken, poet Edna St. Vincent Millay, novelist Theodore Dreiser and art collector Peggy Guggenheim, who raised $4,000 for her. She secured a cottage in the French coastal city of Saint-Tropez and spent two years recounting her life. Berkman offered sharply critical feedback, which she eventually incorporated at the price of a strain on their relationship. Goldman intended the book, Living My Life, as a single volume for a price the working class could afford (she urged no more than $5.00); her publisher Alfred A. Knopf, however, released it as two volumes sold together for $7.50. Goldman was furious, but unable to force a change. Due in large part to the Great Depression, sales were sluggish despite keen interest from libraries around the US. Critical reviews were generally enthusiastic; The New York Times, The New Yorker, and Saturday Review of Literature all listed it as one of the year's top non-fiction books. As the events preceding World War II began to unfold in Europe, Goldman reiterated her opposition to wars waged by governments. "[M]uch as I loathe Hitler, Mussolini, Stalin and Franco", she wrote to a friend, "I would not support a war against them and for the democracies which, in the last analysis, are only Fascist in disguise." She felt that Britain and France had missed their opportunity to oppose fascism, and that the coming war would only result in "a new form of madness in the world". The US Immigration and Naturalization Service allowed her body to be brought back to the United States. She was buried in German Waldheim Cemetery (now named Forest Home Cemetery) in Forest Park, Illinois, a western suburb of Chicago, near the graves of those executed after the Haymarket affair. The bas relief on her grave marker was created by sculptor Jo Davidson. Goldman has been depicted in numerous works of fiction over the years, including Warren Beatty's 1981 film Reds, in which she was portrayed by Maureen Stapleton, who won an Academy Award for her performance. Goldman has also been a character in two Broadway musicals, Ragtime and Assassins. Plays depicting Goldman's life include Howard Zinn's play, Emma; Martin Duberman's Mother Earth (1991); Jessica Litwak's Emma Goldman: Love, Anarchy, and Other Affairs (Goldman's relationship with Berkman and her arrest in connection with McKinley's assassination); Lynn Rogoff's Love Ben, Love Emma (Goldman's relationship with Reitman);, Carol Bolt's Red Emma; and Alexis Roblan's Red Emma and the Mad Monk. Ethel Mannin's 1941 novel Red Rose is also based on Goldman's Life. ^ a b University of Illinois at Chicago Biography of Emma Goldman Archived September 11, 2013, at the Wayback Machine. UIC Library Emma Goldman Collection. Retrieved on December 13, 2008. ^ Streitmatter, Rodger (2001). Voices of Revolution: The Dissident Press in America. New York: Columbia University Press. pp. 122–134. ISBN 0-231-12249-7. ^ "People & Events: Henry Clay Frick (1849-1919)". PBS. March 11, 2004. Archived from the original on July 12, 2015. Retrieved July 10, 2015. ^ Southwick, Albert B. (June 26, 2014). "Emma Goldman pays a visit". Telegram & Gazette. Worcester, Massachusetts. Retrieved July 10, 2015. 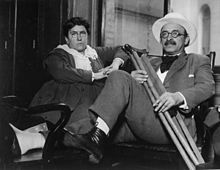 ^ "Alexander Berkman, the Anarchist, to Be Deported; Case of Emma Goldman Now Up for Decision". The New York Times. November 26, 1919. ^ "Panic of 1893". Ohio History Central. Ohio Historical Society, 2007. Retrieved on December 18, 2007. ^ Nellie Bly, "Nelly Bly Again: She Interviews Emma Goldman and Other Anarchists", New York World, September 17, 1893. ^ "Today in History: February 11". Library of Congress. Retrieved January 28, 2014. 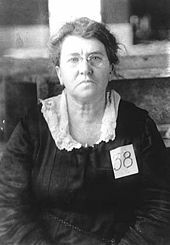 ^ a b "Emma Goldman and A. Berkman Behind the Bars". The New York Times. June 16, 1917. Retrieved December 17, 2007. 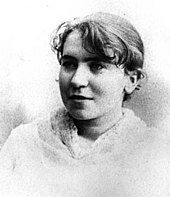 ^ "Deportation Defied by Emma Goldman". The New York Times. October 28, 1919. Retrieved February 4, 2010. ^ "Will Fight Deportation". The New York Times. December 1, 1919. Retrieved February 4, 2010. ^ a b "'Ark' with 300 Reds Sails Early Today for Unnamed Port". The New York Times. December 21, 1919. Retrieved February 1, 2010. ^ Clay, Steven E. (2011). U. S. Army Order Of Battle 1919-1941 (PDF). Volume 4. The Services: Quartermaster, Medical, Military Police, Signal Corps, Chemical Warfare, And Miscellaneous Organizations, 1919-41. 4. Fort Leavenworth, KS 66027: Combat Studies Institute Press. ISBN 9780984190140. LCCN 2010022326. Retrieved October 23, 2014. ^ "Soviet Ark Lands its Reds in Finland". The New York Times. January 18, 1920. Retrieved February 1, 2010. ^ a b c Goldman, Emma. Living My Life. 1931. New York: Dover Publications Inc., 1970. ISBN 0-486-22543-7. 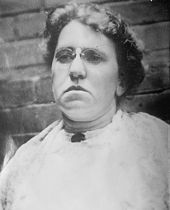 ^ "Emma Goldman, Anarchist, Dead. Internationally Known Figure, Deported From The U.S., Is Stricken In Toronto. Disillusioned By Soviets Opposed Lenin And Trotsky As Betrayers Of Socialism Through Despotism". The New York Times. May 14, 1940. Retrieved April 20, 2008. 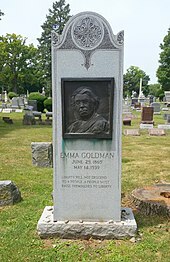 Emma Goldman, internationally known anarchist, died early today at her home here after an illness of several months. She was 70 years old. ^ Avrich, Paul (2005). Anarchist Voices: An Oral History of Anarchism in America. AK Press. p. 491. ISBN 9781904859277. Retrieved December 14, 2015. ^ Goldman, Emma (February 1916). "The Philosophy of Atheism". Mother Earth. Retrieved December 7, 2007. ^ Goldman, "The Failure of Christianity" Archived May 12, 2008, at the Wayback Machine. Mother Earth, April 1913. ^ Avrich, Paul (2006). Anarchist Voices: An Oral History of Anarchism in America. AK Press. p. 45. ISBN 1-904859-27-5. ^ Shulman, Alix Kates. "Dances with Feminists". Women's Review of Books, Vol. IX, #3. December 1991. Retrieved on February 16, 2017. ^ Vincentelli, Elisabeth (August 21, 2018). "Review: Besties With Rasputin in 'Red Emma and the Mad Monk'". The New York Times. Retrieved August 28, 2018. ^ "About Us Archived 2008-01-08 at the Wayback Machine". The Emma Goldman Clinic. 2007. Retrieved on December 15, 2007. ^ "Red Emma's Bookstore Coffeehouse: Who is Red Emma?". Red Emma's Bookstore Coffeehouse. Archived from the original on May 6, 2008. Retrieved February 24, 2008. ^ a b John Clark (May 14, 2007). "Remembering Helen Hill: A New Orleans community comes together after the murder of a friend and activist". Divergences. ^ Goldman, Emma (1932). "Voltairine de Cleyre". Berkeley Heights, New Jersey: Oriole Press. OCLC 12414567. Archived from the original on March 28, 2015. Retrieved February 11, 2011. This page is based on the Wikipedia article Emma Goldman; it is used under the Creative Commons Attribution-ShareAlike 3.0 Unported License (CC-BY-SA). You may redistribute it, verbatim or modified, providing that you comply with the terms of the CC-BY-SA.